So I used to play a lot of video games as a kid. I had an Atari console I hooked up to a black-and-white TV that I'd picked out of the trash. But mostly I played in arcades and pizza places around Boston. I was pretty-to-very good at Pac Man, Asteroids, Galaga, and Lunar Lander, oh, and also Defender, which at the time was no small accomplishment, since it had a joystick plus five control buttons. Oh sure, the kids nowadays have games with more buttons than that, but this was a big step forward in the 1980s. I'll also have you know I was frequently a top-10 ranking player of Missile Command at one of the pizza places I went to in Kenmore Square, under the impressive neon glow of the huge Citgo sign across the street. You'll permit me to add that I mastered an obscure game called Star Castle, a fact which I fantasized would attract the attention of talent scouts (of video games?) and a score of fans who would huddle around me as I racked up millions of points, all of this winning me scholarships and friendships alike. No such luck. For me, the sense of accomplishment was not just in getting a high score, but in puzzling out patterns in how your electronic "opponents," such as the ghosts in Pac Man, would respond to one or another move. (I'm speaking mostly of eat-shoot-bomb-hit games, rather than the scenario games in which, say, you might explore a castle for hidden treasure.) Most of the games I played did not present substantially new challenges with each screen, the ghosts just got faster or the bombs multiplied in number. I never thought of these games as telling stories. They were just situations, that was all. True, some games offered a sense of exploration that paralleled that of literature: you might discover new screens or shortcuts as you advanced in the game. But while there was a nominal conflict -- you vs. the asteroids, you vs. the aliens, you vs. ghosts or kung-fu fighters or robots or whatever other pixelated opponent might appear -- the closest thing to dramatic tension was an addictive buzz. And there was certainly no character, just a "guy," little multicolored blob to stand in for you, the player. 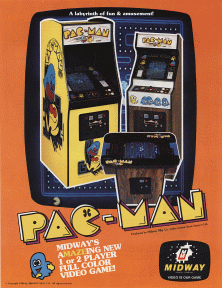 Even the scenarios that came up between screens -- for example, Pac Man falling in love with Ms. Pac Man, then being separated from her by the monsters -- did not constitute a plot, as far as I was concerned, but rather a chance to stretch my arms and fingers for the next round of play. These classic games may have been popular because they highlighted an existential condition in which many people found themselves -- making heroic efforts in defense of self or love or city, and besieged by relentless attackers. In other words, players might have felt, "that's the story of my life!" Bummer of a life, to be sure, but maybe they reenacted the struggle of the besieged everyman (or everyteenageboy). However lightly sketched the video game character might have been, then, he/she/it was really an invitation for the player to fill in the blanks. In this respect, the first-person shooter video games are not unlike novels, which present only limited information -- much more information than a video game, but still limited -- and leave the reader to do the rest. "The rest" was to envision the scenes, to dream up the back-story, to connect emotionally with the characters, or to see these games as portals into other worlds. As with any narrative medium, then, the video game player has to use his (usually his) imagination. But the "Theater of the Arcade," in its flights of fancy, only pointed up some of the limits of the classic video games from which it drew inspiration. The "story" in these games always ends the same: you die and have to put in another quarter. (Or, in the more merciful home console, you simply press the "new game" button.) Either way, the situations are too limited, and the choices you as a character in these games can make are too restricted. You can go left or right or shoot faster or slower, but you can't file a lawsuit, break down crying, plan a surprise birthday party, have an Oedipal complex, go hunting white whales, flee the country on a train, or respond with any number of the other countless actions you could spontaneously take in real life, or be scripted to take in the theater. You can dream up a back-story for even the most sparsely "plotted" video game, but the back-story isn't in the game, it's in you. The games themselves don't offer any sustained conflict for players to respond to -- except, perhaps, for killing and being killed -- and thereby fail to establish the characters, or what kind of creatures they are. Unless a game provides a sufficiently rich environment and set of choices, the characters will never be able to escape the two dimensions in which they are trapped. Tom Bissell has some interesting things to say about video games and narrative in his book "Extra Lives: Why Video Games Matter," which I'll be writing about in Part II of this miniseries on video games.